Balk and runner on first stealing second before pitch is delivered. Erik asked: I had an ump call a balk on my pitcher for not stepping off the pitchers plate, while the first base runner was running to second. I told the ump that since the runner is running it has now turned into a "play" and there is no longer a pick off to be made and that the runner can no longer be decieved by illegal pitch movements. Does the pitcher have to step off the mound to make a throw to second base once the base runner commits to stealing? Rick answered: Erik, thank you for your question. Without seeing the action in real time, hard to say for sure. The portion above about movement of any part of the body, such as he habitually uses in his delivery... that would include starting to pick up his front foot to throw a pitch, which happens with every pitch. 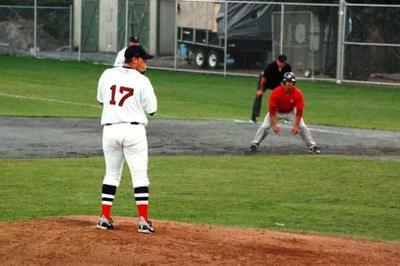 Once the pitcher steps on the rubber, he is restricted in his movements. Any movement by a base runner, prior to his delivery of the pitch, should automatically cause him to step back, thus turning himself into an infielder. Even if he doesn't see it, someone on his team should be yelling "step off". He can then move in any way needed. If he starts to pick up his front foot, and the runner breaks on that movement, the pitcher is locked into going to the plate as that is part of his normal delivery. If he stops that movement, turns and throws to second base, it would be a balk. The start of his motion to the plate created the play, it is then a pitch to the plate and the catcher's throw in an attempt to get the runner at second. 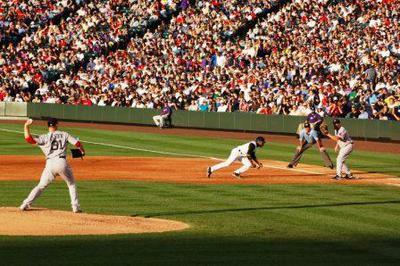 In a first and third situation, we at times start our runner at first base while the pitcher is starting his set. While true, the possibility of deceiving the runner with an illegal pitch movement is erased, the pitcher is still bound to the fact that he is attached to the rubber. He can only free himself from that attachment by following through with the pitch, or stepping back and becoming an infielder. Comments for Balk and runner on first stealing second before pitch is delivered. Zetta: Thank you for your appreciation of my site. I did look at your site, don't believe we share the same audience. This is a youth baseball site for younger kids. The answer for sharing a page would be no. This question reminded me of something -- When did the balk rule come into existence (and why)? Personally, I think that if a base runner is trying to 'sneakingly' steal a base, then the pitcher has the equal right to 'sneakingly' try to throw him out regardless of the pitcher's stance, phase of delivery, or position on the mound. A base runner gets a lead-off; what does the pitcher get?